On Thursday morning, with negotiations at an unbreakable stalemate, I was ready to move on. Then I received that email from "MJ" disinviting me from the lecture I was never invited to and my attitude changed. I don't get mad often. As a seasoned traveler—on land and in life—I brush off most insults, but sometimes people maneuver me into a position where I have no choice but to react. 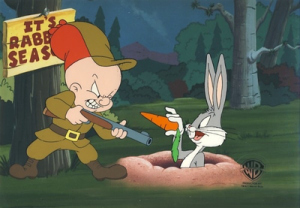 I'm like Bugs Bunny when Fudd sticks a gun down his rabbit hole. At first I'm like, "What's up, doc?" but if Fudd keeps at it, eventually I have to take action using the tools at my disposal. Once I received that email, an obvious course of action came into focus: I needed to make this whole thing public! Suddenly, everything "clicked". I knew what to do, how to do it and how it fit into arc of history and the greater scheme of my own life. I wasn't out for revenge; I was seeking a better world and ultimately a better school. Inadvertently, the clueless administrators had pushed me into exactly the kind of fight that God, if He exists, placed me on this planet for. Not only was I going to make the story public, but I would clearly inform the administration of my actions at each step along the way. I didn't really expect any response from them, but I wanted to create a record that I was giving them every chance in the world to change course. I may not have been polite about it—The time for politics had passed.—but at least I would be clear and direct about my intentions. The formal withdrawal of your invitation is silly, since you never actually invited me. If you sent me an invitation, I never received it, so could you please send it to me again. I was ready to let this matter pass and move on with my tour, but your "formal withdrawal of invitation" pushed me over the edge. Now I need to tell the world about this. So I have one final request: Is it okay if I publish our email correspondence on the internet? It will go into a document that will probably come up whenever anyone Googles "Red Cross Nordic". This document will be permanently available to anyone researching your school and its policies. The title of the document will be "My Speaking Debacle at Red Cross Nordic." I expect to use all of the emails that have been exchanged between me and school staff, including my private emails with Alistair, M---- and other members of the staff. Please review those emails and get back to me. If you are confident of your position, then you should have no problem with making them public. -- I will remove the names of any students (only [Hero] was mentioned), but I will keep your names. I will obscure the first part of your email addresses, but I will keep the school name. -- I am very good at achieving high placement on Google. If you Google for my own name, you will see. -- All of the students who I friended on facebook in Copenhagen are still my Facebook friends now, and I am positively engaged with every one of them. If a student had a complaint against me about Facebook contact, it obviously didn't rise to the level where he or she wanted to defriend me. -- As a US Citizen, I am not bound by the confidentiality laws of Norway (although I will certainly keep student names private). Is it okay for me to publish these emails? If you object, would you kindly state your reasoning. I suspect that you probably will object, but it's your reasons that I want to hear. Can you give me a good argument why I should not publish these emails? Does my email sound like blackmail or extortion? Well, yeah! I knew they had given me a huge arsenal of great writing material, and after all the insults thrown my way, I was in no mood to negotiate. These guys probably weren't going to respond to my threats because there was no leader among them. Technically, the Rektor was the leader, but it was clear he wouldn't do anything but endorse the blunders of his subordinates. Nonetheless, I felt it necessary to make the threat, to make sure they knew a resolution was still possible, even if remote and on my terms. Even if they were too dim to recognize it, I knew my threat was devastating and real. It relied on something called the "Internet". Have you heard of it? It's this big network of information. Whenever you want to know something, you search for keywords, which bring up various documents relating to that topic. If the search terms are broad, you get millions of documents, but when you search for narrow topics, like "Red Cross Nordic" or "Erik Overgaard Pedersen", you get only a few. It was my aim to produce one of those documents—an article that everyone would read when they did serious research into the school or the administrators involved. The Internet turns everyone into a journalist. You may not have the broad impact of major media, but it's relatively easy to garner attention in a local keyword neighborhood. Unfortunately, most people aren't equipped for journalism. They get frustrated with something, write a baseless screed and it goes nowhere. It helps if you know the rules of journalism and how to appeal to an audience. The Google Gods work in mysterious ways, but their algorithms seem to give preference to meaningful documents full of rich content, which I have spent most of my adult life producing. As soon as I sent that email, I started writing the document in my head. It was easy and fun! I composed the words and paragraphs as I drove north from Bergen, and occasionally I would stop to write the words down on my laptop. It turns out this is the perfect mix for me: a few hours of writing interspersed with a few hours of sightseeing in a new place. I couldn't ask for more! 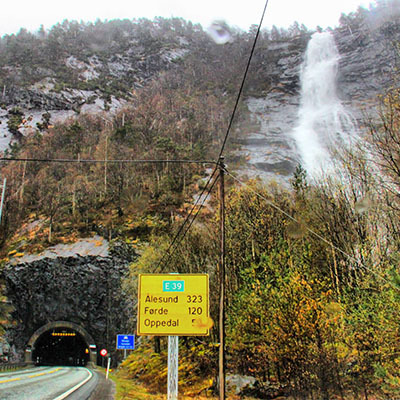 It was early afternoon when I headed north from Bergen (photos). The Rektor's 10am deadline had passed, but my own deadline had not. My only demand was that I needed to meet someone from the college anytime on Thursday, on campus or off. I figured I would give them every reasonable chance to meet that request. It was three hours from Bergen to the vicinity of the campus, but overnight I made a deliberate decision to not go to Flekke (the small town a mile and a half from the campus). I didn't need anyone's permission to go there, but it was a little out of the way from the scenic tour, and I figured it would be politically unwise. The administrators might think I was secretly meeting with students, which would only stoke their paranoia. Instead I headed for F�rde on the main road north about 50 minutes from Flekke. This is where I would make my final stand. As originally planned, I am now in your area, although I am in Forde, not Flekke. 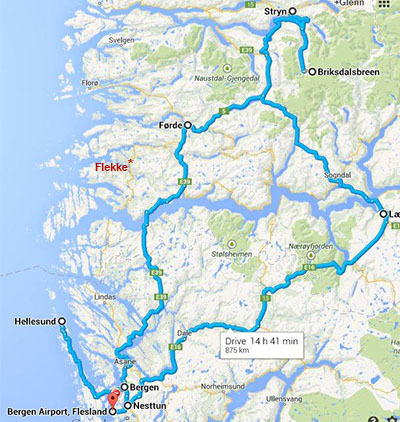 Soon, I will head north to Alesund. This email is one last shot at sanity. Since I cannot meet with you or give my presentation, I will be using this time to start writing my account of the experience, "My Speaking Debacle at UWC Red Cross Nordic." Please Google for "UWC Red Cross Nordic" (with quotes). My document isn't there yet, of course, but I want you to picture it's placement. Since there are relatively few content documents for this search term and mine will be content-rich, you can expect mine to rise high in the listings. Maybe not the first listing page, but easily the second or third. It will be read by anyone doing diligent research on the school, including prospective students, speakers, your sponsors and certainly any journalist who writes about your school. It will create a bit of a sensation when your students discover it. This will be a very long narrative document beginning with my positive experiences in Copenhagen (which you have never heard) and talk about my reasons for wanting to speak (which you have also never heard). I will provide a link to my original proposal and a lengthy account of the long ordeal involved in trying to get on the agenda without anyone at the school speaking to me. Then I will include the emails in sequence, annotated by me with my theories about what is going on behind the scenes. It will be a funny and entertaining document, and Alistair will be the star of the show! This is your last chance to provide your approval or objection. I will take a non-response as your implied approval. I urge you to review our past correspondence, especially the private correspondence between myself and Alistair, to make sure it accurately reflects your school's policies and the public image you want to project. Is this the way you want your school seen by the rest of the world? I truly care about your school and its students (as you will read in my document), which is why I am giving you clear information about what I am doing. It is important to me that I give you every possible opportunity for input. The document may hurt the school in the short term, but I think it will help it in the long term if it promotes better staffing and policy decisions. Google is a mysterious force, and you never know for sure what documents get preference and when, but if this document ranks highly, it will be read by nearly everyone who has dealings with the school. It will be interesting to see what the ramifications are. I didn't receive a reply, of course. I wasn't expecting one. The important thing is that I offered one final shot at redemption. I hung around in F�rde for about a half hour, then I continued driving north, past the point of no return. April 27, 18:00 — Although I wrote most of Chapter 1 within 24 hours of going ballistic, I chose not to publish it until I left Norway on Monday (April 14). Why? The Scandinavian countries have all sorts of draconian privacy laws I don't understand. If I were to publish an article about Norwegian residents or institutions while still in Norway, I would be subject to Norwegian laws, whatever they may be. If I publish from outside the country, then the legal situation gets murkier—which is better for me. If the laws of my own country were applied (since both I and my server are in the USA right now), then I have nothing to fear as long as what I am writing is true (which it is). After following your blog I have to commend on you fantastic storytelling skills. Your fiction is great. See here is the problem, you don't get RCN. You have never lived here or worked here or actually even been here and I know that is what got you writing these blogs. But all you are doing is making students at RCN laugh with your false accusations and "omniscience" over the college. You have no idea how we live or what it is like to live here. Yes we may seem happy go lucky and not a care in the world but truth be told we have to work very hard to fufill the requirements of an outside diploma program. We have classes, compulsory Extra-Academics, studying for exams and our own personal needs to take care of every day. Many of us as students don't need or want you to write this and show what the college is or save us or whatever you said. In actual fact, I personally find this very disrespectful. You are giving the world the wrong view of my home, my family and what has been my life for two years. I know that this may seem very very clich� but it is the truth and I'm sure is also the reason the "Monday Night Massacre" or whatever it is occured. We are not trapped here, alumni from this college have gone on to do great things, without YOU giving them direction. I hope you take the views of students into consideration when writing the rest of your story. You call this document "fiction" filled with "false accusations", but I really need to know what specific facts I have gotten wrong. There may be some style in my storytelling, by I care about the underlying facts and getting them right. You have this anonymous comment form. Just find a some fact I have given that is wrong and I will address it openly. I will certainly take the views of students into account when writing the rest of this document, but they have to express those views (on the comment form or elsewhere). Otherwise, I have to proceed in a vacuum. Absolutely amazing - right around Chapter three I was thinking about Psychospy and wondering if the Hulk would make and appearance... and you did not disappoint!! Just finished reading chapters 10 and 11 by the poolside....keep them coming! Looking forward to the remaining chapters of this extraordinary tale.. This is so incredibly entertaining Glenn. I wish more stuff like this would go viral! It needs to! Alas viralocity is beyond my control. I can't make the fish bite. I can only lay out the bait. I've been reading about your debacle with this Norwegian school over the past several days, at first leery of your intentions, and then coming to understand your stance in this mess of miscommunication and madness. I see two main problems here: 1. The cloudy and amorphous gossipy accusation/comments (?) of an unknown source which started this whole ball rolling, and 2: an obvious lack of communication throughout this entire matter. And now, an obvious stalemate. I do not see how this can be resolved. It would have to involve an admission by someone as to what exactly was intimated by her/him and absolving you of such said accusations, something I can't see happening, and what about these Norwegian laws of slander and the like? Do these laws offer you any recourse? And the miscommunication...whoa...I have to wonder if you had outright written that phone calls on your part are extremely expensive, that some other form of true communication might have been reached. Of course, the time element. Obviously the Powers That Be do not want you on campus until they have a telephone conversation with you. Why? Are they protecting themselves (from the boogeyman) or someone else? Well, I do believe that someone has picked on the wrong person. And because of some buffoonery and unwise decisions, this has resulted. I don't think it will end here. I hope your arsenal is well-stocked. Give 'me hell, Harry! "I do not see how this can be resolved." — It will be resolved, one way or another. Everything always is. The question is when and how. Leadership is a key. Without responsible leadership at the school, we have to take the long, painful road. "I have to wonder if you had outright written that phone calls on your part are extremely expensive, that some other form of true communication might have been reached." — Yes, I did outright write that ("$2/minute"), but there was one option I declined to offer: Skype. I could have Skyped with them at 10am from my hostel, using the hostel wifi. I considered that option and discarded it. I had already taken the position that they need to meet me in the flesh or no lecture, and I was not going to kowtow to this new demand that they speak to me remotely at exactly 10 am. I would only be appeasing their cowardice. A visiting speaker coming as a courtesy from overseas should not have to jump through their last-minute hoops.